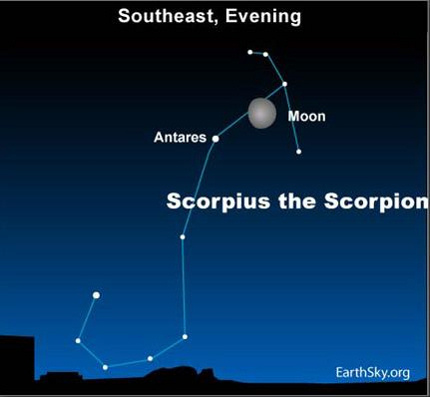 Tonight the moon returns to the constellation Scorpius the Scorpion. The brightest star in the immediate vicinity is Antares, whose name means “like Mars,” because of its similar reddish hue. If you remember your Greek mythology, or perhaps episodes of Xena: Warrior Princess, Ares is the god of war, the counterpart to the Roman god Mars. You can perform the color comparison yourself, because the planet Mars lies in the western sky, near Regulus, the brightest star of Leo the Lion. 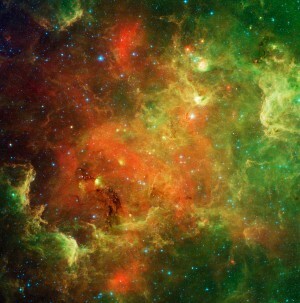 So why is Antares red? Because the outer layer of its atmosphere – its “surface” for lack of a better term for a giant ball of gas – is cooler than other stars that appear whitish. It is still very hot by earthly standards, some 3,100 degrees Celsius (5,600 degrees Fahrenheit), but a far cry from our sun’s surface temperature of 5,200 degrees C (9,400 degrees F). As a result, the light we see from Antares comes mostly from the red side of the spectrum. Site contents copyright © 2019 Recorder Online	except as noted. All rights reserved. | 88 queries in 2.117 seconds.